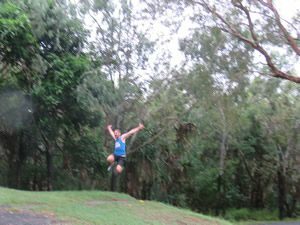 Mackay Road Runners Club Captain and Race Director, Jim Ford was ecstatic at the attendance of the Grand Finale of the Mackay Road Runners Summer Series social group training sessions. Many thanks to his lovely assistants, Alana Ford and Andrew Short, who have been collaborating with Jim to ensure there is an interestingly unique run concept on offer every Sunday afternoon. Runners benefited tremendously from their organisational skills with the off season weekly event which catered for varying abilities with shorter and longer distance options. The Grove Wetlands Double Pump event was also a popularity contest to see who could get the most High Fives throughout the run…..of course, there was no competition as Jim Ford, being the most competitive (after Alana & Peter Ford) took out the coveted prize. Runners also had the pleasure of post-race drinks inside The Grove as well as end of series random draw prizes. 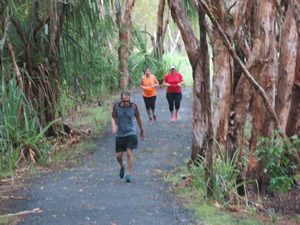 Runners are now looking forward to the new formal 2018 Calendar of events starting with a social 5km at 5.30pm this Sunday at the Mackay Harbour boat ramp/Old Mulherin Park precincts. All new and existing Members are warmly invited to come and try running with the local group that has had their running fix since ’76. The Calendar also includes Signature events such at the BMA Mackay Marina Run, Eungella King of the Mountain, The Magic Mile, 10km Club Championship, Cape Hillsborough Cross Country Club Championship plus many more. Mackay Road Runners also welcomes new and existing runners to meet them at this Sunday’s Mackay Regional Council Sports Sign-on and Sporting Expo at the MECC from 9am to 1pm which showcases the many activities you can be involved in the region including the Mackay Road Runners Club. For those who would love to assist voluntarily with the Club, but not interested in running, you are most welcome to be included within the Club’s very supportive ranks. Members who are keen to join already, please visit mackayroadrunners.com.au Members who join before the end of February are automatically enrolled into Mackay Road Runners database where you will receive regular updates on local and out of town runs, as well as various Club information. 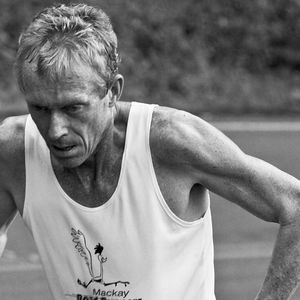 Congratulations to local runner, Julian Picot who will be departing the warm humidity of North Queensland to fly to Japan this weekend to compete in the Iwaki Sunshine Marathon. Julian has been sponsored by the Townsville Running Club after a very successful first local win in the Marathon at their running festival in August last year. Julian’s preparation has been mostly fine with a great taper week in the pouring rain, although the Japanese conditions will definitely be a test being way cooler than in Mackay.